With more than 45 years' experience, Crane Inspection & Certification Bureau (CICB) delivers comprehensive crane & rigging inspector training programs to the construction and general industry across the United States. The company recently announced upcoming programs in Little Rock, AR; Orlando, FL; Portland, OR; St. Paul, MN; Charleston, SC; Binghamton, NY; Amarillo, El Paso and Houston, TX. Inspector programs enable companies to perform their own in-house crane inspections. Training also ensures that inspectors meet the OSHA nd ASME competency requirements. According to OSHA and ANSI/ASME regulations, all cranes, whether they are mobile cranes used in construction or overhead cranes used in general industry (such as manufacturing), need to be inspected before each use, daily, frequently, periodically and annually by either a competent or qualified person. Crane Inspection & Certification Bureau will be offering Crane & Rigging Inspector Training programs at various locations throughout the U.S. in the upcoming months. 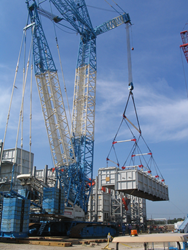 “Employers are responsible to designate Inspectors of specific types and capacities of cranes, just as it is the responsibility of the employers to designate operators, riggers, signal persons, spotters, and assembly / disassembly directors for each lift and each project,” said CICB’s Senior Technical Advisor, Larry Kime. The goal of CICB’s training programs are to reduce accidents and injuries, increase worker skills, productivity and morale, and achieve regulatory, best practice and corporate compliance, and lower maintenance costs, increase reliability and life of the equipment. CICB, headquartered in Orlando FL since 1969 with a second training facility in Houston TX, offers scheduled training programs at our facilities and at various locations across the U.S. or customized on-site training at your facility. CICB’s professionally trained instructors and subject matter experts are not only NCCCO Certified as Mobile, Overhead & Articulating Cranes Operators, but are also CCO Certified Riggers, Signalpersons, and Crane Inspectors. CICB’s trainers are also NCCCO accredited Practical Examiners. CICB’s instructors have been awarded the prestigious Top Trainer Award in 2013, 2012, 2011 and 2009. For more information, contact us at 800-327-1386.